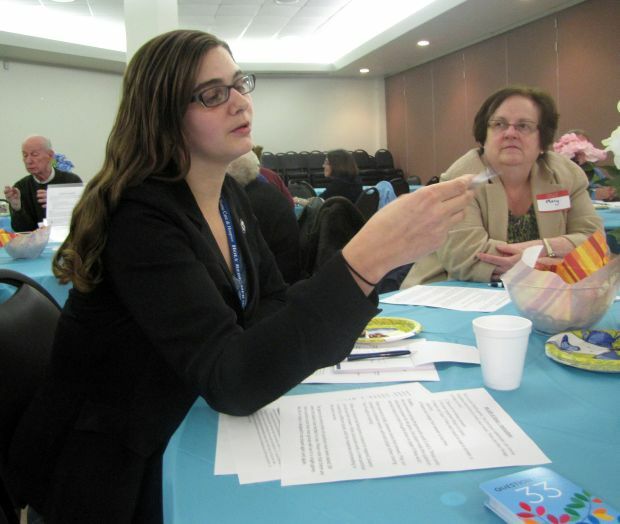 Julia Paolini of Abington reads a question about end-of-life care at Holy Redeemer Hospice’s headquarters in Northeast Philadelphia. As part of National Healthcare Decisions Day, Holy Redeemer Hospice volunteers and staff played My Gift of Grace, a card game that uses questions to guide conversations about funerals, disabilities and positive experiences during a person’s final months. About 60 percent of people say it is “extremely important” not to burden their family with tough, end-of-life decisions, yet more than half have not communicated their wishes, according to a survey by the California Healthcare Foundation. That’s why representatives of Holy Redeemer Hospice joined residents from Montgomery County and Northeast Philadelphia, and across the country, to observe National Healthcare Decisions Day (NHDD). Held each year on April 16 the initiative encourages adults to make advance care planning a priority and to start discussions with loved ones about end-of-life health care preferences. In addition, the initiative encourages individuals to create advance directives, legal documents that appoint a trusted friend or relative to make medical decisions on a patient’s behalf. Holy Redeemer Hospice staff and volunteers from Bucks, Montgomery and Philadelphia counties recently observed NHDD by playing My Gift of Grace, a card game that uses questions to guide conversations about funerals, disabilities and positive experiences during a person’s final months.